It's basically a lemon sorbet, and a tangy one at that. But it has swirls of blueberry and blackberry that provide some fruity contrast. However, the tangy lemon sorbet still provides the more dominant flavor. Hi, we think your blog is amazing! We are just starting our own, and were wondering if you would perhaps like to exchange blog links. We are constantly adding more content, and would love your support! Your blog is a true inspiration for ours. 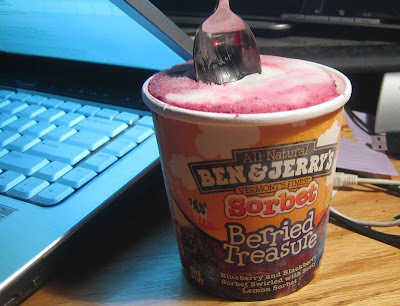 Once you've uncovered Berried Treasure's trove of sunken blue- and blackberry chunks and zingy lemon sorbet swirls, we're pretty sure you'll be forever wanting to hide it from everybody else. Enjoy. I CANT FIND IT ANYWHERE. they used to sell it in the grocery store in jackson hole (i now live in new orleans), but they just don't stock it anywhere. any advice as to how i can get an entire case?